Paying tribute to Claude Debussy on the 100th anniversary of his death made me wish from the very start to create a portrait of him that not only features his undisputed masterpieces, but also recreates his world through the vision of those composers upon whom he had a big influence. 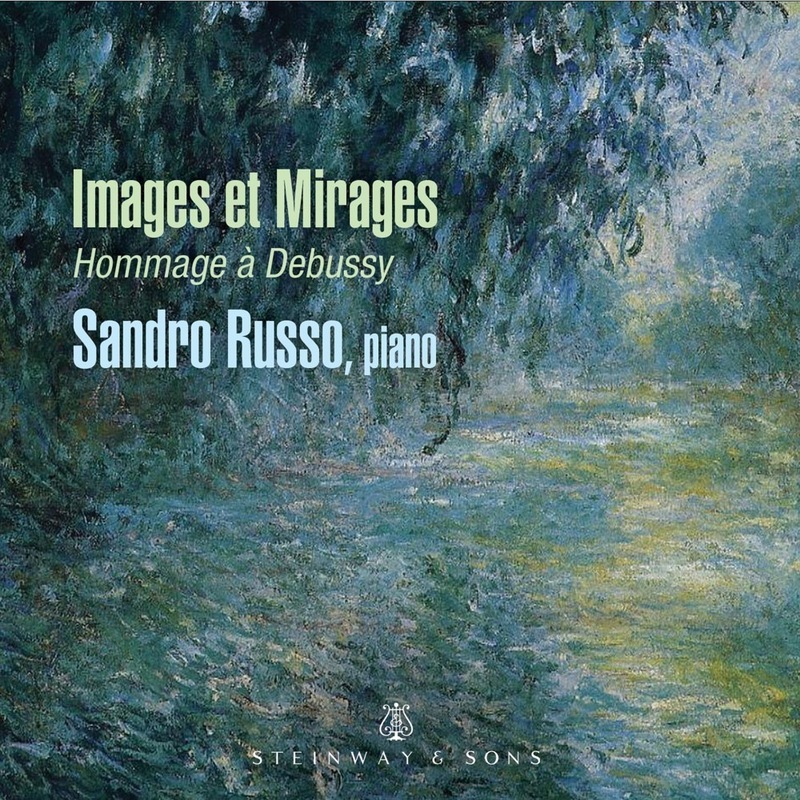 Here’s a late entry among 2018’s numerous Debussy anniversary offerings, featuring pianist Sandro Russo in Images Books 1 and 2, alongside myriad transcriptions plus pieces by other composers written in homage to Debussy. ‘Reflets dans l’eau’ gains contrast and nuance as it progresses, if never quite attaining the litheness and shimmer of Michelangeli or Moravec. By contrast, the steadiness and Read more classical reserve of ‘Hommage à Rameau’ is right on the money. Russo controls the swirling patterns of ‘Mouvements’ perfectly, yet I miss the sheer exhilaration and harmonic shadings distinguishing the Bavouzet and Aimard traversals. Somehow Book 2’s relatively abstract idiom elicits more responsive and flexible pianism from Russo, which was also the case for Stephen Hough’s 2018 Images cycle, notably in the playful accents and petulant crescendos of ‘Poissons d’or’. Russo casts diverse light and shade on the intricate piano-writing throughout Schmitt’s tribute piece, while idiomatically pepping up the little Dukas tribute with just the right dose of sultry spice. In the Dukas, the pianist keeps the decorative filigree and gently insistent tolling repeated notes in consistent three-dimensional perspective. The variety of colour that he draws out of Leonard Borwick’s Prélude à L’après-midi d’un faunetranscription impresses even more when you realise how discreetly Russo pedals. Anyone who can get through the difficult and cruelly exposed hurdles in Vladimir Leyetchkiss’s transcription of ‘Fêtes’ with Russo’s relaxed aplomb has my admiration, but I wish he had imparted more bite and momentum to the central march section. Yet Russo’s effortless foreground/background delineation of Lindaraja in Jean Roger-Ducasse’s solo version makes you forget the original two-piano scoring. Expertly crafted and musically satisfying as the Attwood and Ericourt song transcriptions may be, one still loses the conversational character of Debussy’s word-settings. Once again, Russo reveals a knack for unusual and ear-catching programme concepts and for writing succinct, informative booklet notes. A fine release, overall. It’s evident Sandro Russo knows his charge when it comes to the color-in-want from Claude Debussy. This exposition of the Italian’s wishes and desires is handled with balance, thoughtfulness and introspection. Seeing that this impeccable Steinway & Sons recording is subtitled “Hommage à Debussy” engenders a pensive CD outline. The opening piece, “Reflets dans l’eau”, says it all: we’re in a scarf of rumination...both selection and position of assorted compositions are artistically inclined. The format is unveiled: a Debussy piece is performed, followed by a réflexion [from another composer.] The best representation of this dichotomous resolve lands inside Paul Dukas’ “La Plainte, au loin, du faune” and the indirect pings of Prélude à l’après-midi d’un faune. One of the indelible impressions of M. Russo’s fascinations is how Debussy’s musical warmth is handled with decorum of distance. For example, the Images, Set II elicits persuasive auras without pounding the listener with inveterate literalism...edges are softened without relinquishing Debussian purpose. If Claude Debussy is wholeheartedly personified as “contemporary”, then one’s mind will be reconditioned through the approaches by Borwick and Leyethchkiss. Sandro Russo climbs another rung by politely notching up his take of elegant sophistication. As the clock moves forward, so goes the theory of maturity. Jean Roger-Ducasse’s transcription of Lindaraja makes for a brocaded, sporty habanera-like rhythm, landing yet another argument in favor of M. Russo’s keen persuasive energies. We seem to be moved into a greater mode modern when experiencing interpretations by Koji Attwood and Daniel Ericourt. Their collection of Debussy’s “Three Songs” magnifies the tribute. The listener appears to be catapulted into the 21st century, complimented by the finesse of Sandro Russo. Although Sandro Russo’s overall vibe trends conservatively, pockets of greater determination are ingrained: we turn back to the “Mouvement” from Images. In this case the thematic “rush” is appropriate and predominant. Sandro Russo senses a fast forward thinking approach as he plays the notes, giving Debussy’s movement greater credibility and plausible chemistry. “Images et Mirages” has an even-handed approach to Claude Debussy. Devoid of overt frills and cataclysmic gyrations makes Sandro Russo persuasive, genuine and grounded in performance. A convincing display. Period: 20th Century Written: 1905 France Date of Recording: 5/27 & 6/12 2018 Venue: Patrych Sound Studio, New York City Length: 14 Minutes 58 Secs. Period: 20th Century Written: 1920-1921 Date of Recording: 5/27 & 6/12 2018 Venue: Patrych Sound Studio, New York City Length: 6 Minutes 40 Secs. Period: 20th Century Written: 1907 France Date of Recording: 5/27 & 6/12 2018 Venue: Patrych Sound Studio, New York City Length: 13 Minutes 04 Secs. Period: 20th Century Written: 1892-1894 France Date of Recording: 5/27 & 6/12 2018 Venue: Patrych Sound Studio, New York City Length: 9 Minutes 14 Secs. Period: 20th Century Written: 1920 France Date of Recording: 5/27 & 6/12 2018 Venue: Patrych Sound Studio, New York City Length: 3 Minutes 48 Secs. Period: 20th Century Written: 1897-1899 France Date of Recording: 5/27 & 6/12 2018 Venue: Patrych Sound Studio, New York City Length: 6 Minutes 34 Secs. 7. Homenaje "Le tombeau de Claude Debussy"
Period: 20th Century Written: 1920 Spain Date of Recording: 5/27 & 6/12 2018 Venue: Patrych Sound Studio, New York City Length: 2 Minutes 44 Secs. Period: 20th Century Written: 1901 France Date of Recording: 5/27 & 6/12 2018 Venue: Patrych Sound Studio, New York City Length: 5 Minutes 5 Secs. Period: 20th Century Written: 1880 France Date of Recording: 5/27 & 6/12 2018 Venue: Patrych Sound Studio, New York City Length: 3 Minutes 13 Secs. Period: 20th Century Written: 1885-1888 France Date of Recording: 5/27 & 6/12 2018 Venue: Patrych Sound Studio, New York City Length: 2 Minutes 51 Secs. Period: 20th Century Written: circa 1880 France Date of Recording: 5/27 & 6/12 2018 Venue: Patrych Sound Studio, New York City Length: 2 Minutes 24 Secs.